Careful documentation is essential in all fields of medicine and health care, whether it may serve the treatment of patients, compliance with legal obligations, reimbursement and cost analysis, quality assurance, or clinical research. Clinical documentation must be conducted in a systematic way; otherwise, there is a danger of it becoming a tiresome affair, consuming an excessive amount of time and money, and being of hardly any use. 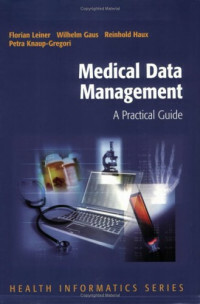 This book describes the basic concepts of clinical documentation and data management. We have tried to keep it as simple as possible— but not simpler. The book is intended to assist you in designing and using clinical documentation and data management systems. We present the most relevant clinical coding systems (e.g., for coding diagnoses) and typical clinical documentation (e.g., the patient record). Hospital information systems and clinical studies are very important application areas of clinical documentation; we give an overview of both. Our thesaurus makes up a good part of the book. Use it to look up definitions and relations of the concepts treated in the book. All concepts defined in the thesaurus are set in boldface the first time they appear in a chapter.